“If you love life, you’ll love France.” This famous travel poster from Hitchcock’s To Catch a Thief says it all! And no one brings you France-not to mention London-like Monograms! On this 11-day vacation to London, Paris, Aix-en-Provence, and Nice, we’ve arranged your hotel reservations, daily breakfast, sightseeing, transportation between cities, and transfers from/to your hotels to/from the train stations. Plus, we’ve arranged for you to have a Local Host® in each city. This feature, offered only by Monograms, ensures you have someone in each city to answer questions, offer suggestions, help arrange activities, and help you get the most out of your vacation. Your vacation begins when you arrive in London. We can pick you up at the airport and take you to your selected hotel, where your Local Host will greet you with a warm welcome, help you get settled, and give you materials to familiarize you with the city. The next morning, after an included breakfast, we’ll pick you up at your hotel for exclusive, private sightseeing with an expert local guide. You’ll hear the inside stories around the must-see attractions, such as Westminster Abbey and Big Ben. 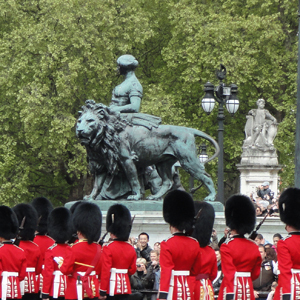 We’ll take you to iconic St. Paul’s Cathedral before arriving in time to see the Changing of the Guard at Buckingham Palace. In London, you’ll also have a full day to explore on your own. Perhaps enjoy a cruise on the Thames River, visit Shakespeare’s Globe Theatre, admire the Crown Jewels at the Tower of London, ride a double-decker bus, and visit the food halls at London’s famous department stores, such as Harrods. Then, it’s off to France-Paris, Aix-en-Provence, and Nice. We’ll pick you up at your London hotel and take you to the train station to catch the high-speed Eurostar train (imagine the thrill of riding through the Chunnel!). In Paris, we’ll pick you up at the train station and take you to your selected hotel, where your Local Host will be on hand to help you get settled and to give you materials about the city. The next day, after an included breakfast, we’ll pick you up at your hotel for guided sightseeing with a local expert. Your sightseeing features Notre Dame Cathedral, dating back to 1163, and the Louvre, the world’s most visited museum. Here, we give you VIP access so that rather than waiting in line, you’ll be up close and personal with Da Vinci’s Mona Lisa and other treasures. During your full free day in Paris, you may want to visit one of the many museums, such as the Musée d’Orsay; shop at one of the department stores, such as the famous Galeries Lafayette, where we have secured shopping discounts for you; take an excursion to Claude Monet’s Giverny and the Palace of Versailles; learn to cook from a French chef; visit the Normandy Landing Beaches; or just sit back and relax as you enjoy a drink or meal on the famous Champs-Elysées. Next up: a train ride via the high-speed TGV train to Aix-en-Provence, where we’ll pick you up at the train station and take you to your hotel. The next morning, after included breakfast, your guided sightseeing with a local expert includes a visit to the Cathedral of the Holy Savior, known for its mismatch of architectural styles. We’ll also take you for a walk along 17th-century Cours Mirabeau, a lively area with fountains, elegant homes, and famous cafés. In your free time, you may want to take an excursion to Avignon, a UNESCO World Heritage Site, to see its Pope’s Palace; visit Cézanne’s studio; or visit one of the local Aix-en-Provence markets. The following day, we’ll take you from your Aix-en-Provence hotel to the train station for your journey to Nice, and once you arrive in Nice, we’ll pick you up at the train station and take you to your hotel. In Nice, your guided sightseeing with a local expert features the inside stories only locals know; the Promenade des Anglais, Nice’s most famous boulevard; and a walk through the Old Town. A full day at leisure in Nice will allow you to explore at your own pace (with the support of your Local Host, of course). Perhaps take an excursion to St. Tropez; browse the famous flower market; sample local specialties such as rosé wine and Salad Niçoise; or just relax on the beach.